We believe every leader has enormous potential, unique to them and based on their upbringing, talents, and experiences. But it can be difficult for a leader to see and act on this potential without support. Without clear insight, a practical plan, and accountability, leaders are destined to fall short. Our coaches are passionate about helping leaders gain clarity, then moving quickly to create a “roadmap” for reaching their potential. A meaningful and productive executive coaching relationship is both an art and a science. As a firm grounded in the science of measurement, we emphasize the importance of data in any executive coaching engagement. Data -not “gut feel”- should provide the insights, inform priority next steps, and help evaluate progress. There’s also a very personal side of an executive coaching relationship, and that’s where the “art” comes into play. Every leader is unique, with different core desires, unique preferences and styles, and varying needs around coaching interventions. With an average of 20+ years of experience, 3D Group’s coaches have mastered this balance of art and science – and achieve extraordinary results. 3D Group offers customized professional development workshops that focus on management and leadership skills. If you have identified a development need for a group of employees in your organization, our consultants will work with you to develop a custom program to help your employees improve their skills, work better together, or create shared goals to improve results. We examine individual needs, group issues, current changes in order to customize the workshop to the challenges your department or organization is facing today. We work to customize a program that addresses your needs. We not only ensure the right topics are covered, but the methods we use fit your culture and individual styles. We use a variety of methods to access engage participants with diverse learning styles. Workshops can range from 2-hours to 4 days, and may be off-site or on-site. We use our Participant Attitudes and Reactions survey (PAR) to assess reactions, learning, and likelihood of transfer. We can also provide a retention and application-focused assessment as a 6 or 10-week follow up. When the stakes are high, in-depth leadership assessment gives you the greatest chance of making the best choice. 3D Group’s leadership assessments provide an independent evaluation of a leader’s potential to succeed in senior leadership positions and identify potential risks associated with hiring or promotion. 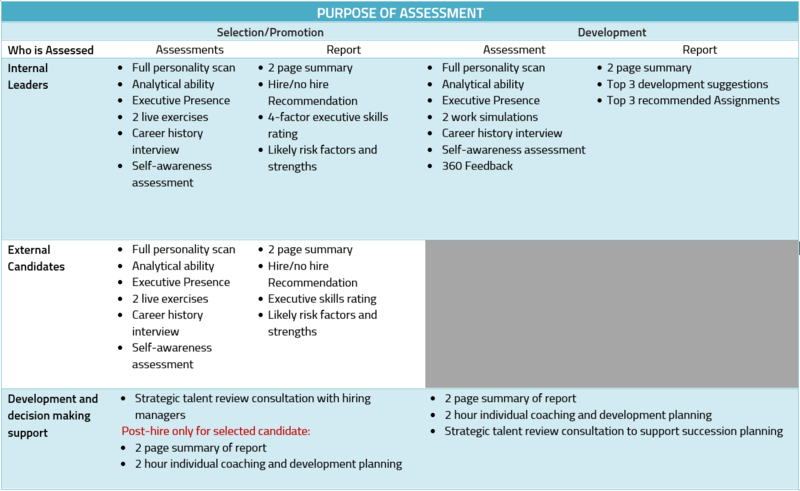 Our comprehensive assessment process can be configured to fit client or role-specific competency models, and our recommendations for hiring or development are deeply grounded in the business context within which each leader will work. Reporting elements and support are tailored to each client’s needs and purpose for the assessment, and follow up development support is available for internal candidates as well as the individual who is hired. Our 5-hour, live assessment process covers the full range of dimensions that predict success in senior level positions by using a set of pre-validated, nationally-normed measures, live simulations, and, when possible, 360 Feedback. Want to see more details on our Leadership Assessment options? Click to expand! Start Driving Individual Success. Contact Us Today! The CEO of a biotech startup decided that the company needed to level up their leadership skills based on a recent engagement survey. He charged his VP of HR with creating a data-driven leadership development process that would address both individual and group-wide challenges. The company had just established a set of 5 core values, but wanted to use a pre-validated leadership model for broader coverage and norms. All 67 leaders received 360 degree feedback using 3D Group’s Leadership Navigator® Corporate Leader survey and every leader received a 1:1 feedback coaching session to establish a clear set of development priorities. 3D Group analyzed group-wide trends to determine critical training needs and worked with the senior management team to tailor a training curriculum to support leadership training year-round. Early CEO involvement/buy-in and organization-wide participation. Group-wide data with norms shaped tailored leadership training. Resources invested in follow-up coaching instead of extensive survey customization.